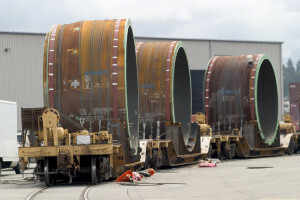 The Port of Vancouver serves as the Pacific Northwest’s major consolidation centre for breakbulk cargo such as forest products, steel and machinery. Breakbulk cargo is handled through one of two terminals at the port – the closest and most competitive gateway for project cargo bound for western Canadian resource projects. The port offers flexibility with cargo handling options and reliable and efficient vessel loading and discharging services. We offer easy access to extensive road connections, as well as established corridors for overweight and over dimensional project cargoes. CN and CP railways service on-dock rail facilities at all 27 terminals and provide service to key destinations across North America. BNSF and Southern Railway of British Columbia (SRY) links further enhance these networks. Fraser Surrey Docks Surrey, Fraser River Fraser Surrey Docks LP Fraser Surrey Docks is a multi-purpose marine terminal handling containers, and breakbulk commodities such as general cargo, logs, steel, machinery and project cargo. Lynnterm North Vancouver, North Shore Burrard Inlet Western Stevedoring Lynnterm is the consolidation centre for forest products, steel and other breakbulk commodities in the Pacific Northwest. It handles wood pulp and paper, lumber, panel products, steel products, project cargo, and machinery. Flat cars can carry up to 90,719 kg (200,000 lbs) shipping weight. Specially designed heavy duty railcars can support loads upwards of 680,388 kg (1,500,000 lbs). Shipments outside the size and weight guidelines listed below must receive an official railway clearance supplied by the origin railroad company. Actual limits will depend on seasonal conditions, routes and equipment used. 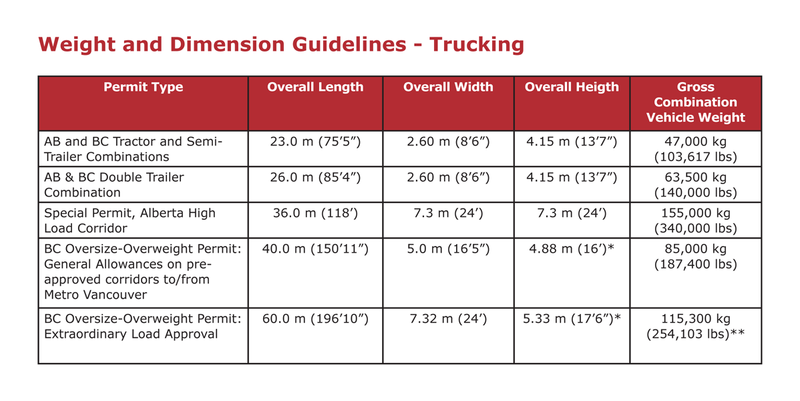 For oversized and/or overweight loads, a permit must be issued by the Government of British Columbia Ministry of Transportation and Infrastructure, Commercial Vehicle Safety and Enforcement Branch prior to transportation. For cargo transported into the Province of Alberta, please also contact the Government of Alberta Ministry of Transportation. *To be refreshed as per regular ministry updates.